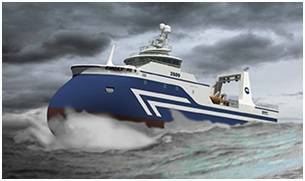 Fishing company HB Grandi of Iceland recently awarded Naust Marine a contract for complete winch outfitting of three new 180 ft. fishing trawlers. The contract, of record size for the winch supplier, will see Naust provide no less than 20 electrical winches per vessel, including two trawl winches and three Gilsons each; four sweep-line winches, one out-haul winch, one cod-end winch, two backstrap winches, three retriever winces, one third wire winch and one trix-winch, located close to the sweep line winches. In addition to these, there are two anchor-mooring winches. On the bridge, Naust’s vaunted automatic trawl winch (ATW) system controls the winches with many functionalities. Apart from constant synchronized tension on both trawl warps and others common to autotrawl, Naust’s on-the-bridge management even includes control of the trawl winches’ ESG levelwinds by touch screen. In addition, the gilson winches, sweep-line winches and the net drum have controls that both synchronize operations and provide constant tension (CT control). Electric winches’ regenerative kW capabilities have also been much discussed in recent years. Two DC-powered trawl winches can produce 200 kW in regenerative power—during shooting alone—for other consumers aboard to use. With the advent of sophisticated shaft generators, the use of thyristor drives provides even greater opportunities for routing energy back into the trawler’s power system. Thyristor drives and DC motors have been key to all major Naust Marine contracts in recent years for the trawl winches alone, while all other winches on board have AC motors. AC motors have also been utilized for the trawl winches, although the electronics are somewhat more complicated for routing the regenerated power back to the electrical system on board. The trawl winches develop 30 tons of nominal line pull at 40 meters per minute bare drum, but can reach a maximum of 40 tons line pull. A horizontally-mounted 210 kW at 620 rpm DC motor powers each trawl winch. The winch drum holds 1,500 fathoms of 30 mm wire. The trawl winches and the ATW system facilitate both bottom and mid-water trawling. The 55 KW-Gilson winches have 18 tons line pull bare drum, and are AC-powered, like the balance of the auxiliary winch suite. The Gilson winches are in turn connected to retriever winches, for haul-back and keeping constant tension on the Gilson lines. Variable frequency is the recurring theme throughout the vessel, with variable-speed main engines being deemed most economical for the function. Naust will install many variable-frequency drives (VFDs), rectifiers and other electronics to allow all other consumers on the power grid aboard to handle variable speed. The vessels are presently under construction at the Celiktrans Shipyard, in Turkey. 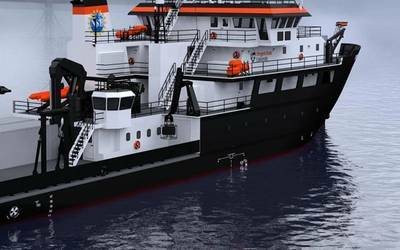 The first of the NAUTIC-designed trawlers will be delivered in first quarter 2016. The first winches are due for delivery in November, 2015.